Dr. Abhishek Kumar is currently working in the Department of Zoology at DDU Gorakhpur University Gorakhpur, India. He obtained his PhD in Life Sciences from same University in 2012, MSc in (Zoology – Fish and fisheries) from RML Aawadh University Faizabad India in 2004. His topic of PhD thesis is “Botanical Pesticides: Effects on Blood Parameters and Calcium Regulating Endocrine Glands of Teleost Heteropneustes Fossils”. His research interest includes Botanicals Toxicity on Fish, and its impact on Calcium Regulating Endocrine Glands. 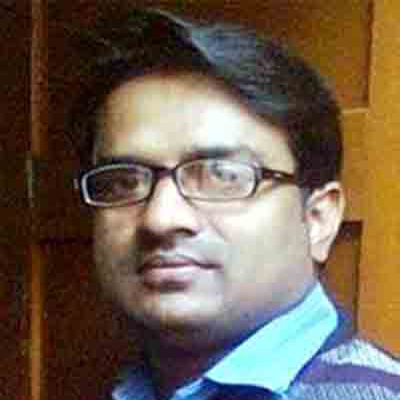 Dr. Abhishek Kumar is member of Indian Science congress Association (ISCA), Calcutta. He is also serving the international scientific community by extending expertise as editor/ reviewer of journal. He published (16) articles in journals, (1) book chapter, (12) abstracts as author/co- author. He has attended number of conferences and workshops. Prasad, M.R., A. Kumar, N. Suzuki and A.K. Srivastav, 2015. Botanical pesticide Nerium indicum alters prolactin cells of stinging catfish, Heteropneustes fossilis. Int. J. Zool. Invest., 1: 77-84. Prakash, C., A. Kumar, M. Prasad, S.K. Srivastav and A.K. Srivastav, 2015. Microcystin-LR attenuates blood calcium and phosphate levels in stinging catfish Heteropneustes fossilis. Int. J. Pharma Bio Sci., 6: 1147-1153. Kumar, A., M. Prasad, S.K. Srivastav, N. Suzuki and A.K. Srivastav, 2015. Toxicological impacts of a botanical pesticide, azadirachtin on corpuscles of Stannius of stinging catfish, Heteropneustes fossilis. Int. J. Environ. Sci. Technol., 12: 507-512. Prasad, M., A. Kumar, S.K. Srivastav, N. Suzuki and A.K. Srivastav, 2014. Cyto-architectural alterations in the corpuscles of stannius of stinging catfish Heteropneustes fossilis after exposure to a botanical pesticide (Nerium indicum). Iran. J. Toxicol., 8: 1017-1024. Prasad, M.R., A. Kumar, S.K. Srivastav and A.K. Srivastav, 2013. Nerium indicum, a botanical pesticide affects ultimobranchial gland of the catfish Heteropneustes fossilis. Environ. Toxicol., 28: 661-665. Kumar, A., M.R. Prasad, K. Srivastava, S.K. Srivastav and N. Suzuki et al., 2013. Cyto-histopathological alterations in the liver of azadirachtin treated catfish, Heteropneustes fossilis. Proc. National Acad. Sci. India Sec. B Biol. Sci., 83: 609-613. Kumar, A., M. Prasad, N. Suzuki, S.K. Srivastav and A.K. Srivastav, 2013. Influence of a botanical pesticide, azadirachtin, on ultimobranchial gland of the freshwater catfish Heteropneustes fossilis. Toxicol. Environ. Chem., 95: 1702-1711. Kumar, A., M.R. Prasad, D. Mishra, S.K. Srivastav and A.K. Srivastav, 2012. Acute toxicity of azadirachtin to a teleost, Heteropneustes fossilis. ACTA Scientiarum Biol. Sci., 34: 213-216. Srivastav, A.K., V.K. Das, S.K. Srivastav and A. Kumar, 2011. Environmental Contaminants: Impact on Endocrinal Calcium Regulation in Fish. In: Emerging Trends in Zoology, Srivastava, U.C. and S. Kumar (Eds.). Vol. 1, Narendra Publishing House, India, ISBN: 9789380428253, pp: 319-334. Prasad, M., A. Kumar, S.K. Srivastav and A.K. Srivastav, 2011. Euphorbia royleana, a botanical pesticide affects ultimobranchial gland of the catfish Heteropneustes fossilis. Egypt. J. Biol., 13: 14-20. Prasad, M., A. Kumar, D. Mishra, S.K. Srivastav and A.K. Srivastav, 2011. Blood electrolytes of the freshwater catfish Heteropneustes fossilis in response to treatment with a botanical pesticide (latex of Euphorbia royleana). Integr. Zool., 6: 150-156. Prasad, M., A. Kumar, D. Mishra, S.K. Srivastav and A.K. Srivastav, 2011. Alterations in blood electrolytes of a freshwater catfish Heteropneustes fossilis in response to treatment with a botanical pesticide, Nerium indicum leaf extract. Fish Physiol. Biochem., 37: 505-510. Kumar, A., M.R. Prasad, D. Mishra, S.K. Srivastav and A.K. Srivastav, 2011. Effects of Euphorbia tirucalli latex on blood calcium and phosphate of the freshwater air-breathing catfish Heteropneustes fossilis. Toxicol. Environ. Chem., 93: 585-592. Kumar, A., M.R. Prasad, D. Mishra, S.K. Srivastav and A.K. Srivastav, 2011. Botanical pesticide, azadirachtin attenuates blood electrolytes of a freshwater catfish Heteropneustes fossilis. Pestic. Biochem. Physiol., 99: 170-173. Prasad, M.R., A. Kumar, D. Mishra, S.K. Srivastav and A.K. Srivastav, 2010. Acute toxicity of Euphorbia royleana Boiss (Euphorbiaceae) latex on freshwater catfish, Heteropneustes fossilis. ACTA Toxicol. Argent., 18: 5-9. Kumar, A., M.R. Prasad, K. Srivastava, S. Tripathi and A.K. Srivastav, 2010. Branchial histopathological study of catfish Heteropneustes fossilis following exposure to purified neem extract, azadirachtin. World J. Zool., 5: 239-243. Kumar, A., M. Prasad, D. Mishra, S.K. Srivastav and A.K. Srivastav, 2010. Toxicity of aqueous extract of Euphorbia tirucalli latex on catfish, Heteropneustes fossilis. Ecotoxicol. Environ. Saf., 73: 1671-1673. Prasad, M., A. Kumar, D. Mishra, S.L. Srivastav, N. Suzuki and A. Srivastav, 2009. Acute toxicities of diethyl ether and ethanol extracted Nerium indicum leaf to the fish, Heteropneustes fossilis. Niger. J. Nat. Prod. Med., 13: 53-57.